Fruit in bowl, a photo by Helen in Wales on Flickr. This week the challenge was to make use of the PhotoShop Diffuse Glow filter. 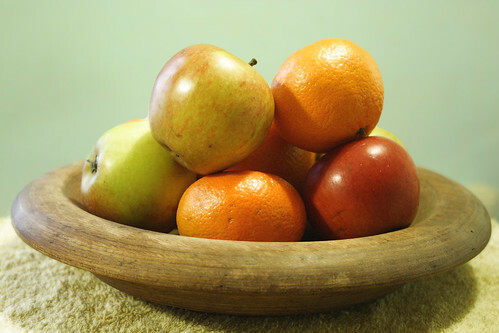 Having no flowers available, I thought I'd try the classic bowl of fruit still life. That's lovely -- the glow is there in all the varied textures of fruit, wood and the towelling underneath. Although I don't comment on most of Your pictures it is always a delight. I adore the composition of this. I like you countryside picures most but I am always surpized of Your ideas what to photograph and how. The colors here are just wonderful. The background complements/compliments the fruit perfectly. How does the diffuse glow filter work? What would the photo have looked like without it?